They were singing so softly I couldn’t discern the words. The sound seeped into the late morning, the fields around us and now abides sweetly in the memory. Carmel peered back at me over the shoulders of Loupe Vicky who insisted on carrying the obviously tired toddler back from the village. What had begun as a cool morning had long since turned into a typically sweltering African day. We had left the house hurriedly after breakfast, our goal was Kopetatum a village about a mile and a half from our house. I anticipated the heat and the decreasing speed of my two-year old. The walk became an adventure. She pointed out every ant in the path, we picked flowers purple and orange, she leaped over a dead centipede, and braved the jungle of grass that towered above her head, while her baby sister slept soundly strapped to my chest. Our friends, Leah, Acia Rose and Akol Josephine, caught up to us as we began to spy the tops of thatch roofs. Akol with her swollen belly and Acia with a healing knee did not mind the pace. We passed through the thorn fence and wound our way through the narrow inner paths to the home of three church members. Lucia is old and blind. One of her eyes was removed last year after she was beaten over a quarrel about work with an aid farming project. She sat sewing together sandals that were long past their prime. Her daughter Takan, is mentally disabled. She will always greet you with a girlish, gapped smile and inevitably faces away from the pulpit when she first arrives at church leading her mother by her walking stick. The granddaughter, Nait, was born because an unknown man took advantage of a helpless woman. She is now eight years old and weighs as much as Carmel. Lucia had other children and a husband. They all abandoned her. I don’t know why. During the last song on Sunday, Nait laid down on a concrete pew convulsing with tears because of the pain. She had severe malaria. Her distress was noticed by other mission members and she was quickly taken to the clinic where she received treatment. The following day, Lucia was also found to have malaria, although not as severe. Our visit was on Tuesday. They both seemed to be improving and were dutifully completing their medication. They laid out a mat for us to sit on in the shade. Zion woke and began to cry at the sunlight when I peeled her away from my chest. Carmel sat shyly beside me gulping down water. We greeted the handful who came and went during our visit and chatted while Lucia continued sewing together her broken sandal. The other women taught a health lesson for the small crowd. Before we left, we gave them a bag of rice, bananas and some passion fruit. 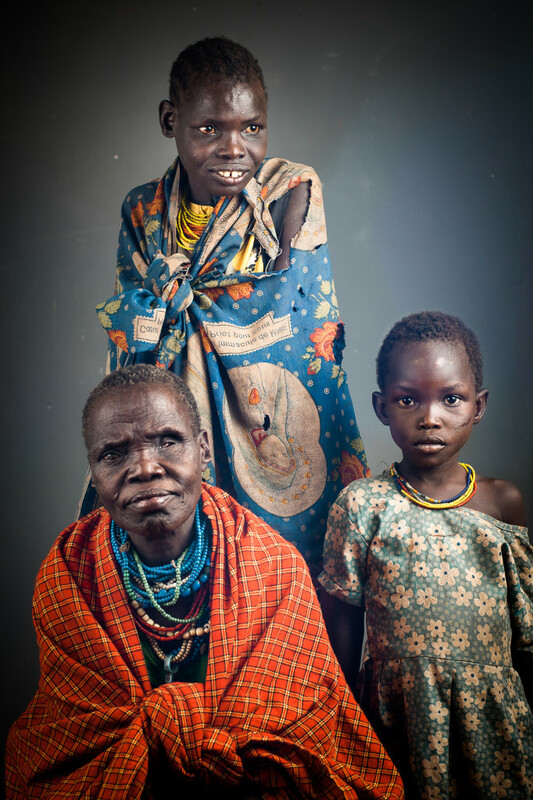 It is the time of hunger in Karamoja, when the stock from last year has been sown as seed, when the rains continue their fickle taunting dance, when the crops reach slowly to the sky only a hope of food. Many are hungry, but even in the days of plenty when we hear celebration dances every night, when the crops have yielded their fruit and guarantee a feast, we don’t understand how these three survive. None of them is able to work a field by themselves, or carry water on their heads or firewood from the fields. They have no close family who cares for them, only neighbors and the church. They are faithful attenders and rarely ask for assistance. Through the ache in recognition of their situation we ask the question, what is the best way to help? How do we provide assistance without creating dependence on white missionaries who’s goal is to leave behind a self-sustaining church? How do we empower without creating victims? We were encouraged by another church member that it is better to do something than nothing because we’re worrying about the backlash. However, action without thought can cause more damage and even break what equilibrium exists that is presently keeping them alive. So we will move forward with creating ways to feed and care for them, ever with a prayer for grace and success. May these three precious souls who have been and will remain to be in God’s hands, receive His love and His provision through His body in this world. May we have the wisdom to do it in a way that glorifies God and speaks a witness more loudly than words. Congratulations on your beautiful, little daughter and, of course, on her delightful, big sister. We look forward to meeting them and seeing all of you later this summer. I just finished reading all your posts of the past months. Each one is so informative and interesting. Thank you for your work there and for keeping us ‘posted’! You write so poetically your thots and daily life routines. I will pray with you for wisdom and kindness, for the least of these.